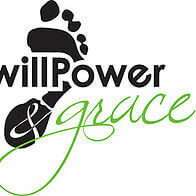 willPower & grace® is a group exercise program. A formatted fusion of postures and drills, willPower & grace® is the high-energy, cardiovascular solution that mind-body practitioners have been looking for, and the foot-fitness conditioning program that athletes need. This workout is as philosophical is it is physical; a full-body functional workout meets sports psychology. We integrate the smartest and safest barefoot training methods to strengthen your feet while progressively correcting imbalances in your ankles, knees and hips. This unique workout appeals to “morning moms”, sports athletes, and teens, but must be experienced to be understood.